One of my coworkers came to me with this project several months ago. She has a non-average-sized head and has trouble finding fun hats off the shelf that actually fit. And she loves to wear fun hats. She’s the type that can wear anything and pull it off with finesse. So she brought me a magazine with a photo of the hat she wanted (page 55). I took measurements, got color preferences, obtained materials, and searched for patterns. This hat works better in crochet and cotton, so I pulled together seven of the best cotton colors I could find, keeping budget in mind. I found some similar hat patterns but nothing that was sized right or striped. I would have to adjust and improvise. It was horrible. All the patterns were top down construction, so I couldn’t tell how far I needed to go in order for it to end up the right size until it was too far. I ripped out – a lot. The colors were scaring me, the transitions were ugly, and the shape was all wrong. It was too much beret and not enough tam and slouch. It got to the point where I hated working on it and wanted to give up. I finally finished it and she tried it on. It was definitely all wrong, but it fit. Scored one point at least. So I decided to try it again, starting completely over from scratch. 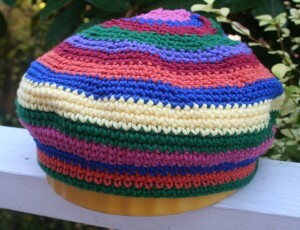 Because it is striped, I had more than enough yarn left. This time, I searched for inspiration from knitted patterns as well. Bingo. I was still working in crochet, but I could take some cues from a few slouchy knit hat patterns for bottom up construction. I began with a very awkward joined chain that matched her measurements and continued up from the band, increasing to make it bloom where it was supposed to, working level to the desired height, then decreasing to the top. Along the way, I consulted the picture. It only felt wrong in a couple of places so that I ripped back a row or two, but nothing like the first attempt. I was having so much fun I whipped it out over a couple of days. 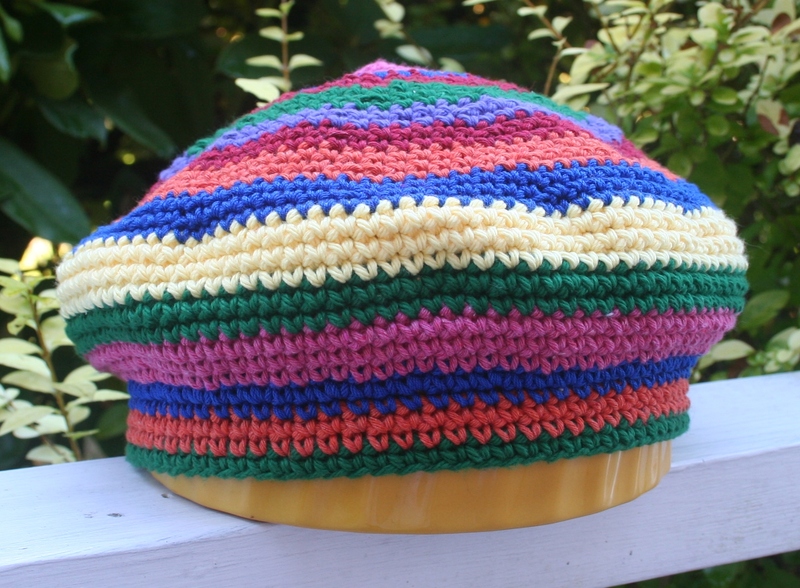 This entry was posted in Knitting and tagged crochet, hat. Bookmark the permalink. Good job! Looks great. Hope it fits.